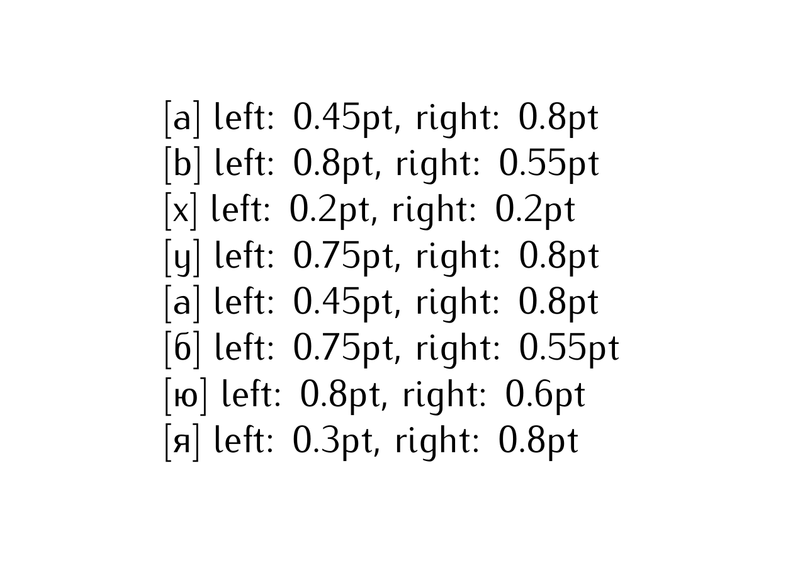 which allows me to align text more precisely to the ink by accessing the side-bearing measurements (\XeTeXglyphbounds1 and 3). This XeTeX dependency is currently the only thing stopping me from moving to LuaTeX (mainly for microtype). Is an equivalent function available in LuaTeX, or planned? After reading a bit more on microtype, could the equivalent effect be achieved by an appropriately-tailored set of character protrusions? That way, my move to LuaTeX might be a lot simpler. Convenience gist of the files. Yes and no. When you load the font via the built-in fontloader library (which is very low level), you can access all the information of the font file. This includes the bounding box, as far as I can see (look at the section 4.4.5.1.2 "Glyph items" in the LuaTeX reference manual). But normally you load the fonts via the fontspec / luaotfload packages, which discard that information and only keep what is needed for TeX. I doubt that inclusion of that information is planned in the luaotfload package, which is based on ConTeXt's font loader. Not the answer you're looking for? Browse other questions tagged xetex horizontal-alignment luatex or ask your own question. How to fix side-bearing (e.g. add extra side-bearing) for a single character? Is there a LuaTeX analogue to XeTeXinterchartoks? XeTeX, LuaTeX: a good investment?